Are you an ardent fan of fishing who would love to catch more fish? If yes then probably you’ve come to the right place. If you are an individual who’s taken up the hobby of fishing seriously, then you’ve heard of fish finders. These are useful devices which use transducers to send the sound waves under the water to help find out whether or not there are fish below that particular area. A fish finder allows you to see a graphic representation of what is beneath your boat, allowing you to identify fish quickly. They are currently available in a wide range of options, and this implies that the prospect of finding the perfect device based on your pocket, can sometimes prove difficult. Kayak fish finders are equipment that should help you find a fish while fishing. These types of devices make fishing much more comfortable. The best kayak fish finder is one that carries a combination of important functions that makes fish finding easy. If you are currently looking to purchase the best fish finders, we have provided you with a simple guide that will get you started. Here are some of the best kayak fish finders that you can find in the market. The Garmin Striker is a relatively affordable fish finder which boasts of robust and fantastic features. With it at your disposal, you’ll find fishing easier than before. So what are the features that set this fish finder apart? The Waypoint Map allows you to navigate with ease. Bearing in mind that it is equipped with a high-sensitivity GPS, you can potentially examine your position, about your marked waypoints. The waypoint map makes it virtually easy for you to view, mark and navigate to locations such as docks, stumps and brush piles. What’s more, this feature is an excellent tool for tracing your way back to the boat motor. It offers convenience and efficiency. The striker 4 is typically easy to use fish finder which boasts of the keyed interface, allowing you to operate it smoothly. Its dedicated buttons also make it simple to handle. It’s easy to install, and this makes it ideal for those who have little to no knowledge regarding how fish finders function. Regarding convenience, the fish finder has smooth scaling graphics which offer uninterrupted imagery, especially when switching between the depth-range scales. Again, the sonar history rewind gives you the opportunity to scroll back through your sonar images to mark the waypoints you could have missed. It has an inbuilt flasher which displays the speed information. This is an essential tool which ensures that you can troll at the right speed based on the lure you are using as well as for the particular fish species. Besides, it is an excellent way to find out if you are traveling at the right speed in wake-controlled locations. The striker four fish finder has a Garmin CHIRP 77/200 kHz transducer, which offers a relatively higher level of visibility, detail, and clarity. In fact, the CHIRP transmits a continuous wave of frequencies which range from high to low, before interpreting them upon their return independently. The bearing in mind that these frequencies display a broad spectrum of data, CHIRP sonar technology can potentially create crisper fish arches with enhanced target separation. Most importantly, you also have the chance to upgrade the device to high-performance CHIRP Garmin functionality. This will probably allow you to experience crystal-clear images with remarkable target separation as well as a resolution from deeper to shallow depths. Overall, this is a robust and affordable fish finder. 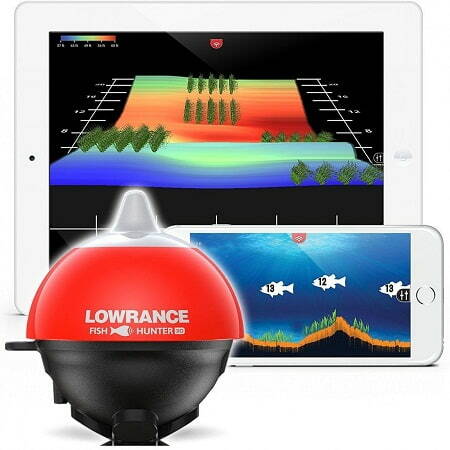 Arguably, this is by far the best fish finder in this particular price range. It is a highly versatile device, suitable for all types of fishing. You can use for shore fishing, boat, kayak as well as ice fishing. It floats on water, transmitting full water column and bottom information to your tablet or smartphone’s screen. It functions by capturing the lower structure, vegetation, location of fish, depth as well as the other essential data points which promote productive fishing. It is equipped with robust temperature sensors which provide accurate readings of the water condition so users can always know the perfect biting conditions. Again, you can explore the water, by tracking rocks and pits, underwater vegetation, the migrating shoal as well as the sunken timber. Overall, this is a fantastic fishing device which can take your deep sea fishing experience to the next level. The device is both tablet and Smartphone compatible to give readings to the user. It works for both Android and Apple iOS systems, a feature which makes it ideal for nearly anybody. The Deeper Smart Portable can work in areas which other fish finder devices can’t access. Whether you are fishing from the dock, shore or boat, it will effectively discharge its duties. What’s more, it functions in both offline and online modes. You’ll also get to enjoy its incredible functional features such as Fishing Notes, Solunar Forecast Calendar, Offline Maps, Camera, Screen color mode among other helpful qualities. The battery life of this fishing devices lasts for up to six hours on a full charge. It displays readings up to a range of 130 feet down, allowing you to focus on multiple fishing spots. It is ideal for individuals who love spending their time fishing and reeling some of the largest fish. 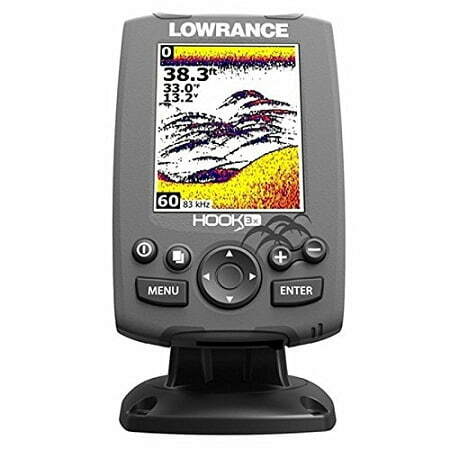 The Lowrance 3X-Sonar has a five-inch color display with high resolution. 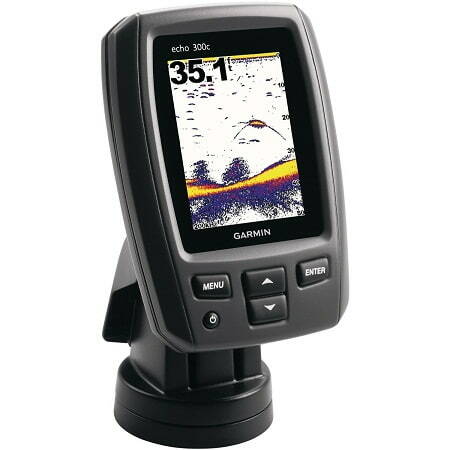 It is a high-quality fish finder which offers proven features at a good value. It is extremely convenient. It boasts of LED-backlit three-inch color display with detailed 320 by 240 resolutions, that’s quite easy to see from broad viewing angles and in complete sunlight. The broadband Sounder detail helps you to easily identify fish targets, thermoclines, bottom hardness, the bottom contour, structure detail and more. If you are an individual who fancies vertical drop-shotting techniques, the 200kHz offers you up to two hundred degrees of conical coverage for increased fish-target separation as well as lure-tracking. The fish I.D. at its disposal displays fish icons instead of fish arches thus allowing you to identify your fish targets easily. This fish finder doesn’t require you to possess lots of technical knowledge to operate it. In fact, you just have to turn it on, and it will begin to send the data back straightway. Its dedicated quick buttons allow you to zoom up to four times the conventional view and concentrate on the key fishing locations. It is imperative to note that this device features an Advanced Signal Processing (ASP) Technology, which helps limit the need to regulate settings to examine the structure and bottom detail manually. The pages button enables you to effortlessly switch between 200 kHz and 83 kHz sonar frequency angles. Another impressive feature is the patented Skimmer transducer with the built-in moisture temperature sensor, which can track the bottom of the fishing zone up to 75 mph. All these features make this fish finder a worthwhile investment for any serious fishing fan. The device is designed to make fish catching simple through its 3.5 in sunlight readable display that can be easily used despite the glaring sun. Fishing is an outdoor activity that is mostly done under the sun. The device is designed to deliver accurate results under these environments. The device has a Garmin HD-ID target tracking technology that makes it possible to have a view through the water with the device, you have eyes under the water without interference. When you see the fish right in the water, as possible from the remote location of the device. Garmin HD-ID target tracking technology puts the fish on the spot within the waters. 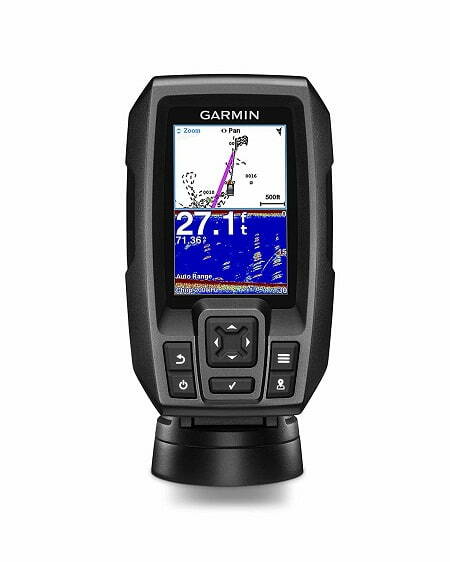 Other than the Garmin HD-ID the device is installed with a 300- watt (RMS) sounder that improves the viewing by enabling viewing angle for up to 120 degrees and a depth of 1500ft. This device can assess the position of the fish from the different angler. It understands the movement of fish, therefore, giving a more accurate positioning of the fish. The display is improved through the uninterrupted view supported by the sonar imaging and echo 300c Garmin smooth scaling technology allowing the user to retain the sonar history despite the changes in depth and range. The device is simple to use. It is a mount and goes device that makes it simple. The installation of the device takes a few minutes through the quick tilt mount that improves the use having a device that is simple to use yet effective means anyone can use it with ease and achieve the desired results. This fish finder is one of the most powerful finders that you will find in the market. The portable finder has a trendy look that adds to its ability to track fish under water and make fishing easy. The display of the device is perfect for finding the fish. It has 5 powerful tri-frequency transducers support it with these high-performance features, you enjoy a coverage area that is five times bigger than any other fish finder that you will find in the market. With these features, you can view fish from a broader scope and still have a better view. If you have been looking for a 3D wireless sonar capability device, this is the only device that you will find in the market that comes with 5 sonar views option. You get to enjoy contour mapping, 3D fishing, a view of 3D structured mapping, and directional casting. You also get to enjoy ice fishing flasher view that makes your fishing in ice much more comfortable. The depth and range of a device are critical to its performance. These features determine the scope of view you get. It also determines how far you can find a fish. This device has a range of 160ft, and you can find ice fish to up to a depth of 100ft. It comes with other additional useful features such as Wi-Fi connectivity that can be reached to a range of 150ft. The Wi-Fi works devoid of cell phone tower reception. 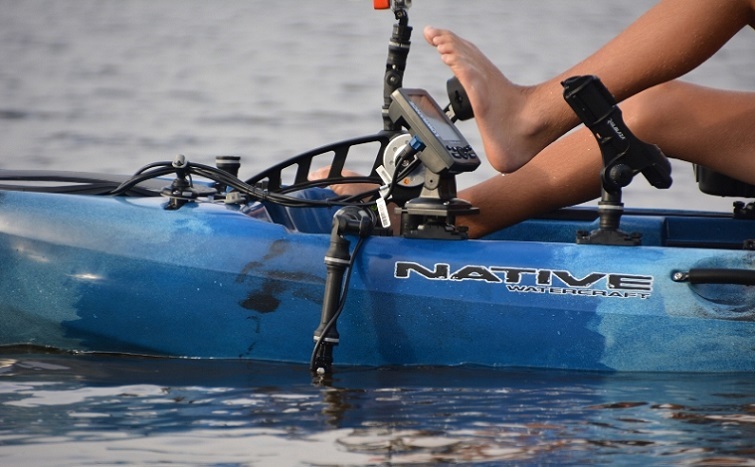 You can easily cast the machine on your water boat or kayak and move around the water body searching for fish while still connected. The device can also be trolled to up to 2MPH making it an active device to spot fish accurately. The device is installed with a high tech display. It has a 2.4″TFT LCD screen that allows display even when there is sunlight. With the 512 color TFT LCD, you can have a clear view of the underwater. Moreover, it comes with a white LED front light that makes morning fishing easy. 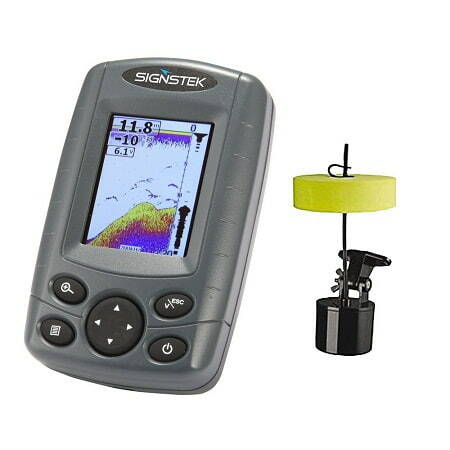 The Signstek FF-003 Portable Fish Finder has personal sonar detectors. With the personal sonar detectors, the device can display the waves of the water to the bottom and show the contours. This ability enables you to see the big and small fishes in their respective depths. The display also shows the water temperatures at the time. The device comes with features to adjust sensitivity. Depending on the situation, you can change the water sensitivity to a level that is suitable for you. The levels include various levels up to 100 levels of sensitivity. It also has a multi-level depth range that adjusts the ability of the instrument to the specific depth. The great thing about this device is that it is easy to operate. All you need is to turn it on and cast out the sensors. With the simple process, you will be able to have a view of the underwater and find the fish that you are looking for. It is every man’s tool that offers much more but comes with a simple operation manual. If you love fishing, you’ll highly appreciate a fish finder. Fish finders offer lots of benefits, a phenomenon that makes them must-have fishing gadgets. There are currently numerous fish finders out there on the market and vary regarding the price, features, functionality, and you can choose them based on your needs and preferences. If you are finding for the best fish finder, we have given three promising devices to choose from these fabulous fish finders which are not only affordable but boast of great features to help you enjoy your fishing activity. 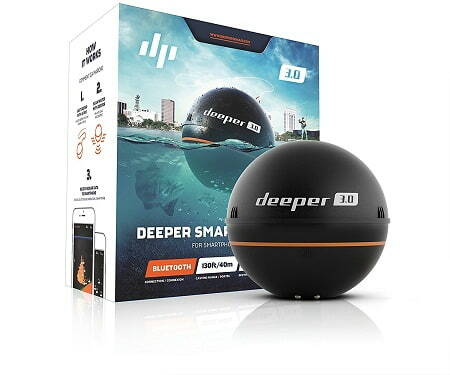 We recommend the Deeper Smart Portable Fish Finder. Although it comes at a higher price, you get the value that you need. Deeper Smart Portable Fish Finder understands the fishing environment and delivers the right tool for that purpose.